My Oh My! I’ve had ants in my pants over this DIY Sliding Barn Door Loft Bed project for months now and I am SO EXCITED to finally share the plans and tutorial with you guys! Are you ready for this? Hunker down, friends, this is gonna be one ton of fun. 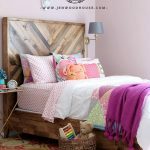 If you follow me on Instagram, you’ll have seen sneak peeks and behind-the-scenes footage as we were building this DIY sliding barn door loft bed. I saved the Instagram stories in my highlights, so feel free to check that out. By the way – this plan fits a full-size mattress and the total cost was about $550.00. Also, just for reference, we have 9-foot ceilings in this room. Do you want the cliff notes? 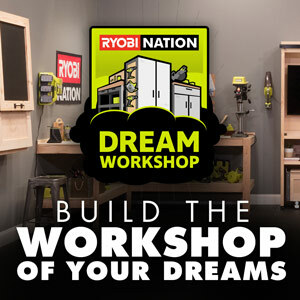 Here’s how it’s gonna all shake out… and if you’re curious about the basics of staining and finishing wood, watch the videos at the end of this post! (1) Woodtite 1-inch Fasteners 50 pcs. 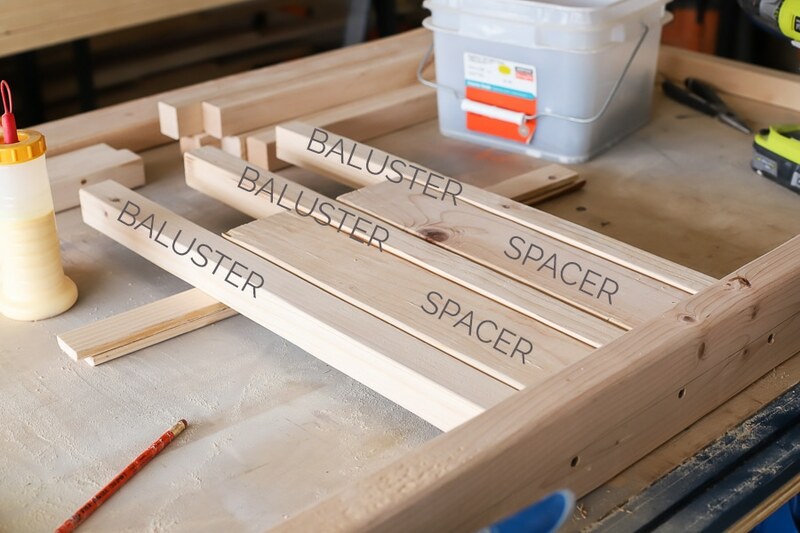 You can purchase 2×2 lumber off-the-shelf, but we found it to be more cost-effective to rip down 2×4 studs to make the 2×2 balusters. We used a 2×4 spacer to evenly space the balusters 3 1/2 inches apart. 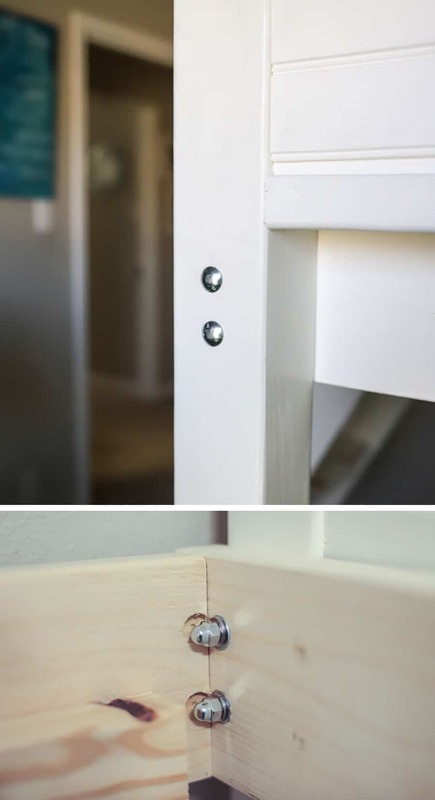 Pre-drill pilot holes and countersink the 2 1/2-inch wood screws. It’s also a good idea to sand the balusters before you attach them. Lather, rinse, repeat eleventy times. Fill the screw holes with wood filler, then sand smooth. Does your Home Depot sell 2×3 lumber? My Texas store location does, but I could never find them when we lived in Alabama. If you can get your hands on some 2x3s, they’ll work best because they allow the tongue-and-groove boards to be slightly inset. In the photo below, the rails are 2x4s and the stiles are 2x3s. See the inset? Now you’ll be able to attach the 3/4-inch thick T&G boards and not have them stick out past the 2x4s. Notice how the T&G boards fit nicely into place. 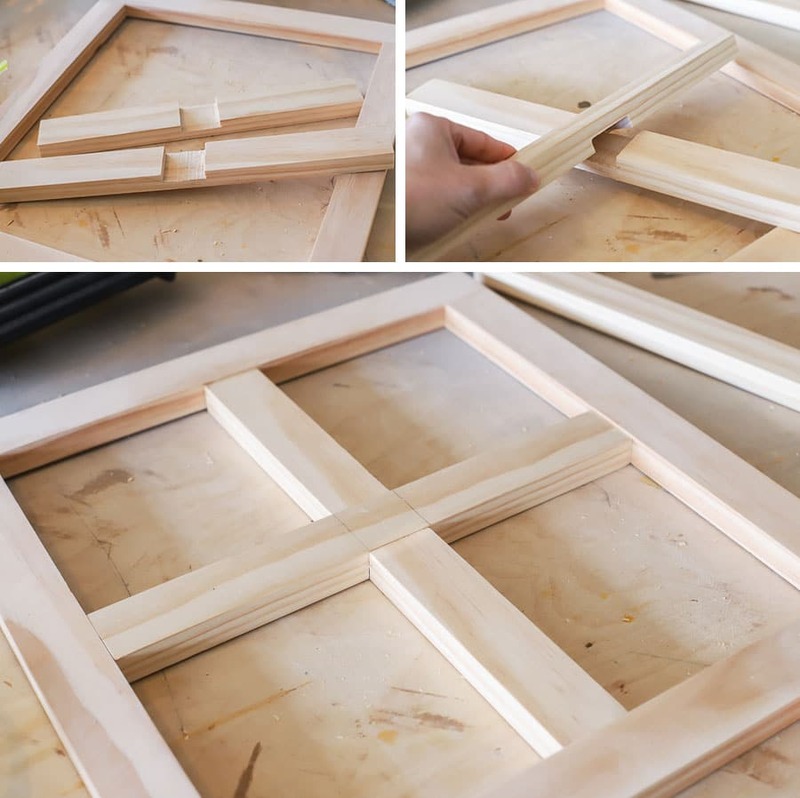 Once you build the frame, you’ll just glue and nail the T&G boards in place – easy peasy. The photo below shows one constructed side panel. You’ll build two of these, of course. These will end up being the headboard and footboard of the bed. Special shoutout to my good friend and neighbor, Tamra. She’s a supermom to 6 kids (3 of which are triplets! 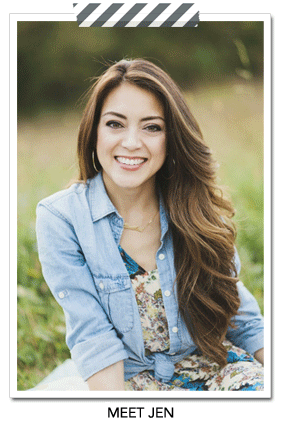 ), Army wife, and overall amazing friend. She’s been a Godsend. Tamra’s not only listened to me over-analyze, second-guess, and agonize over every part of this project, but she helped me sand and paint ALL THE THINGS. And there were so many things to be sanded and painted. She’s a trooper. Thank you, Tamra! I built each component (railings, side panels, front and back panels, mattress box) separately, then brought everything into the room for assembly, but I’d recommend building as you go, if you can. No matter how accurate my measurements were, once Adam and I got the parts into the room, those pre-determined measurements changed and shifted as we put the bed together. So, if you can (and if you have the patience and time), build as you go. Meaning, build the two side panels and back railing, then take the completed side panels into the room, then attach the back railing. The side railings are permanently attached, while the back railing slides into place with these fence brackets. This makes disassembly much easier when it comes time to PCS (move). Measure the space for the mattress box, then build accordingly. Attach the mattress box to the legs, then measure the space for the front and back panels, then build for those dimensions… and so on and so forth. Make sense? Because I built the side, front, and back panels beforehand, then tried to put it all together in the room, there was a lot of trial and error. We’d carry the front panel into the room, try to fit it into position, discovered it wouldn’t fit, then have to take it back out to the shop to shave the sides down with a hand planer and belt sander until the front panel fit into place. Same thing goes for the back panel. My sweet husband. He lifts all the heavy things. Repeatedly. God bless him. If you build as you go, you’ll be able to measure and then build to those measurements. 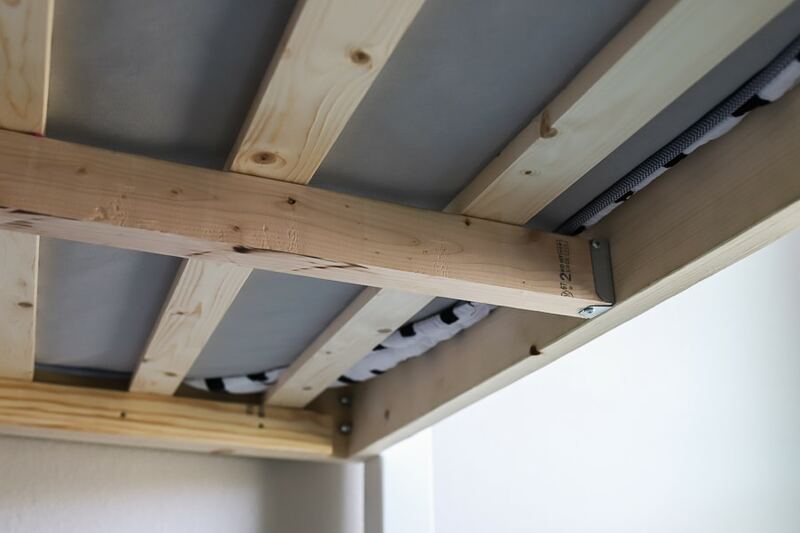 If you choose to build the loft bed the way I did, just know that you’ll likely need to make adjustments along the way. I hope you have a sweet husband who lifts heavy things repeatedly too. Same song and dance for this part too – the stiles are 2x3s while the rails are 2x4s, which allows space for the tongue-and-groove boards to be slightly inset from the 2×4 rail. Attach the T&G boards with glue and nails. For the windows, I constructed the outer frame with pocket hole joinery and cut overlap joints for the muntins (the criss-cross part). The muntins were then attached to the frame with pocket screws. I cut the lap joints with several passes on the table saw. You can also use a circular saw for this – just be sure to set the depth of the cut so that you’re removing half the amount of material on both pieces so that when you join the two, you’ll have a flush surface. This part is pretty easy. 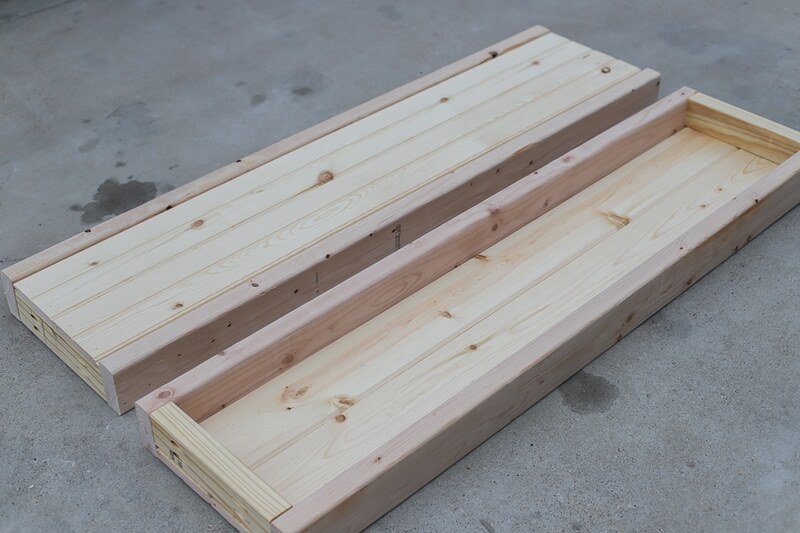 First, you’ll build the box out of 2x6s and 2 1/2-inch wood screws. Check for square, adjust as necessary. 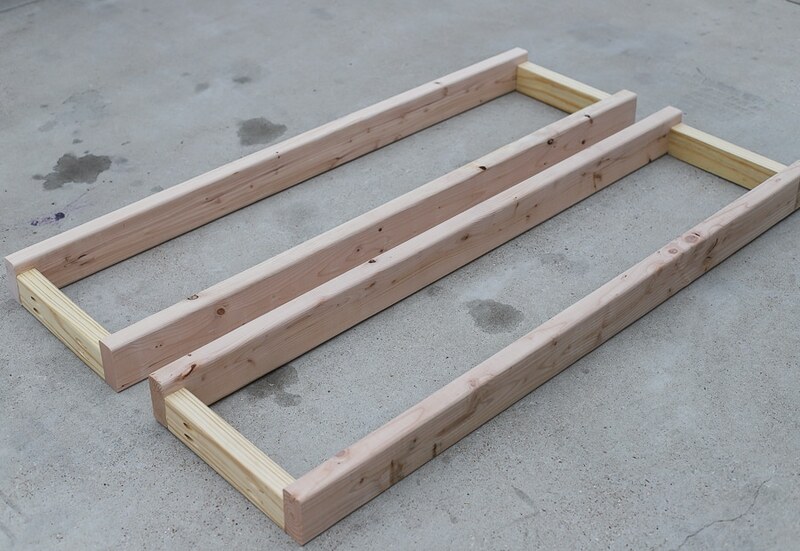 Next, you’ll attach the 2×3 mattress cleats to the sides of the bed box. 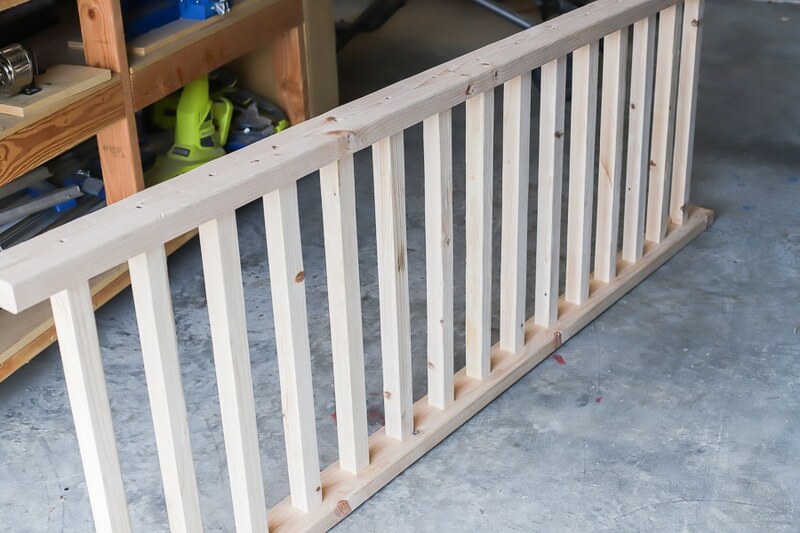 Measure and mark the center point on the short ends and attach the fence brackets. These brackets will hold the center support so that the mattress doesn’t sag. Bring the mattress box into the room and attach it to the 4×4 legs. This is where we used the carriage bolts, flat washers, split locking washers, and cap nuts. We pre-drilled the holes into the 4×4 legs and 2×6 mattress box, then inserted the carriage bolts, washers, and cap nuts. You’ll see where I had to carve out a space in the adjacent boards for the cap nuts. If you place your hardware further inward, you shouldn’t have this problem. 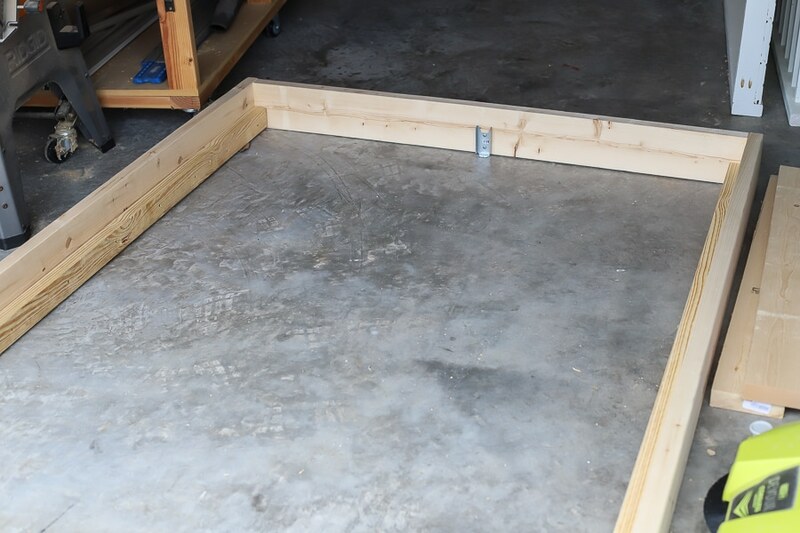 Once the mattress box is in place, you can measure and cut the 1×3 mattress slats and lay them in place. I spaced them about 5 1/2 inches apart (I used a scrap tongue-and-groove board as a spacer) and screwed them down with 1 1/4-inch wood screws. 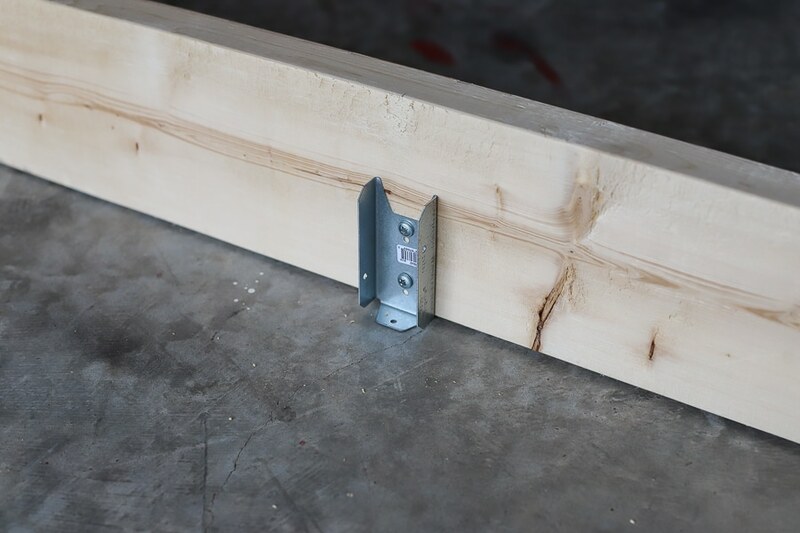 Be sure to pre-drill pilot holes so that you minimize the risk of the wood splitting. This is also a good time to put the full-size mattress in – once you have all the walls attached, it’ll be a tough job to wrestle the mattress inside. After hemming and hawing over whether to build stairs or a ladder, I finally decided to build stairs. I used 1×8 boards for this, which is plenty strong for the kiddos, but I feel a little uneasy when my husband puts his weight on these stairs. You may want to use 2×8 boards if you have trust issues like I do. I used leftover scrap tongue-and-groove boards and 1×3 mattress slats to build the doors. Measure, mark, and cut the T&G boards to length, plank them together, then attach the 1×3 boards on top with glue and nails. Simple enough. I used Varathane’s Golden Oak wood stain for the barn doors. Below, you’ll find a couple helpful videos on my staining and finishing process. 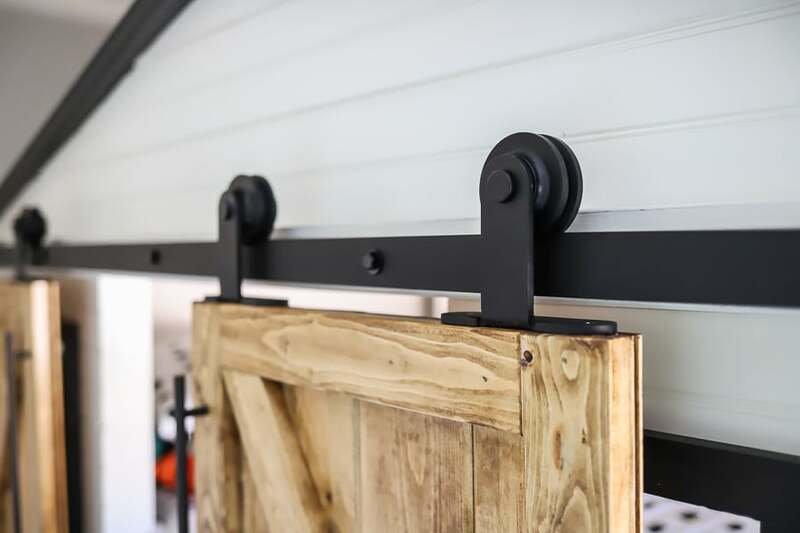 Installing the sliding barn door hardware was very straight-forward. The instructions that came with it were very easy to follow. 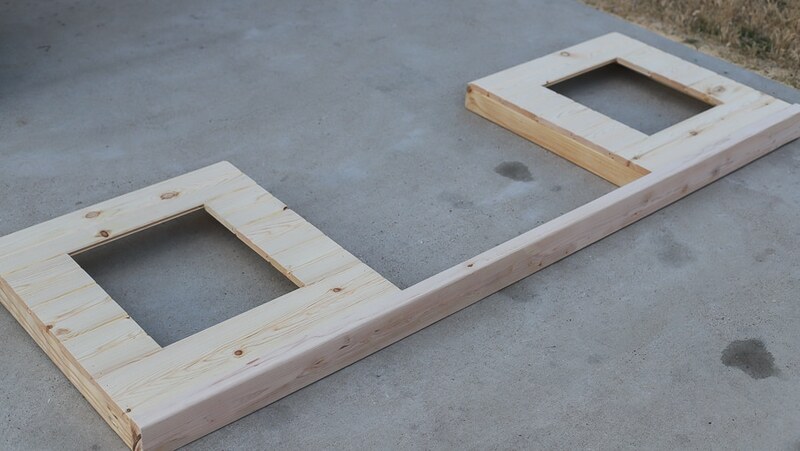 Remember, the hardware set includes 2 hangers, so you’ll need to order 2 more because you need 4 total – 2 for each door. We did have to cut the metal rail down from 96 inches to 79 inches – we used an angle grinder for this, then used a file to remove any burrs and sharp edges and touched up the edges with black spray paint. We screwed the top mount hangers onto the doors, positioned and tightened the door stoppers, then hung the doors. Because this DIY sliding barn door loft bed already weighs a ton, I didn’t want to add too much more weight with the roof. I considered real shingles (too messy and gravelly), cedar shingles (not available in-store), plywood (more weight)… you name it, I probably considered it. I finally decided on these polycarbonate corrugated roof panels. They’re super light and come in different colors – you may even choose the translucent roof panels, if you want more light to come through. We chose the 8-foot panels in Castle Grey and used battery-powered RYOBI shears to cut it. 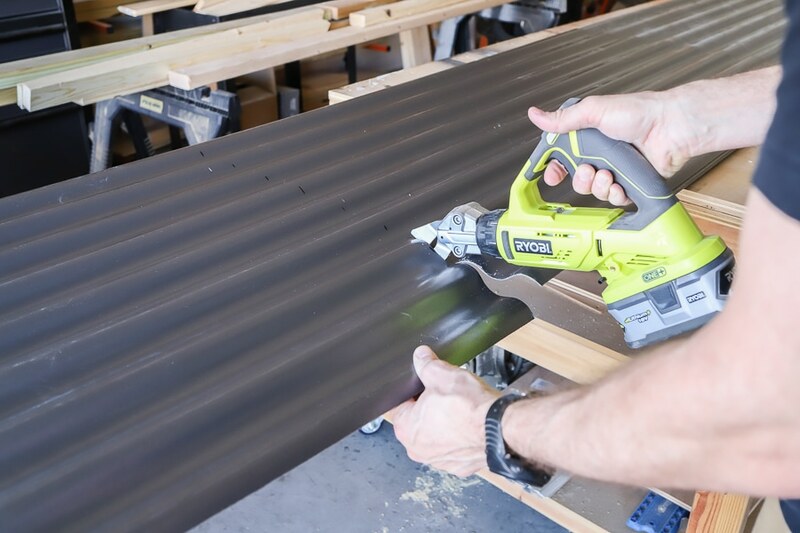 You can also use a circular saw or even some heavy duty kitchen shears – the panels are plastic, so they’re super light and easy to work with. 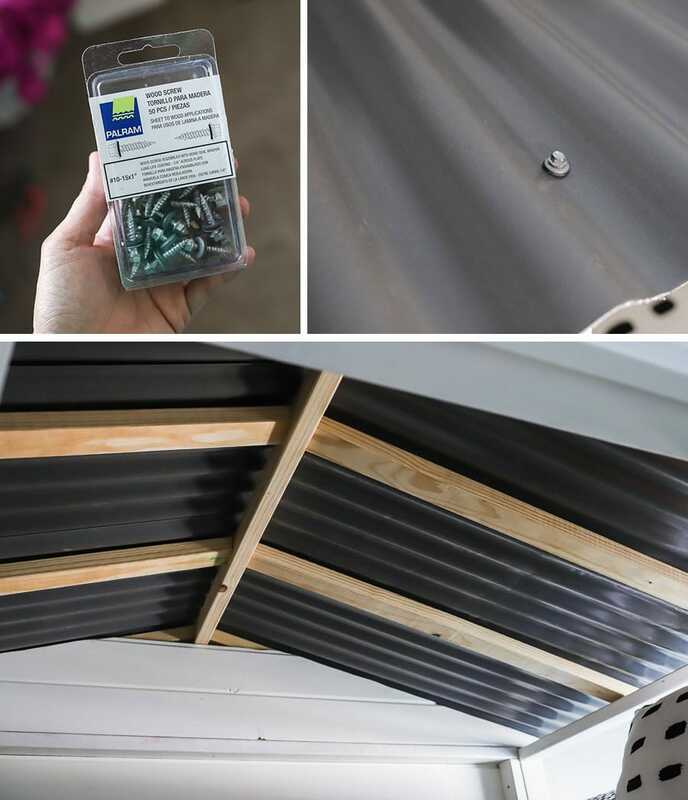 We used these wood screws with foam washers to attach the roof panels to the rafters. I kind of wish I would have either stained or painted these rafters. Oh, well. Hindsight is 20/20, isn’t it? We also switched out the existing ceiling fan for this pretty flush mount light fixture. Isn’t it perfect?! 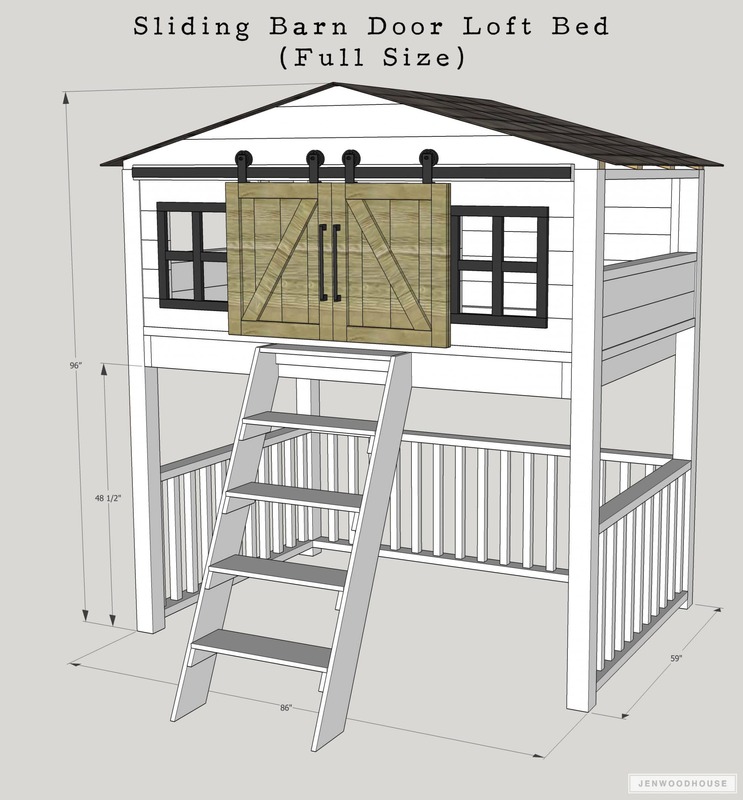 So… are you ready to build your own DIY Sliding Barn Door Loft Bed? I’ve got you covered with the plans! Hope you enjoy them – feel free to reach out if you have any questions along the way and please tag me on social media if you build this bed – I’d LOVE to see your versions! Happy building! *This project is sponsored by The Home Depot. This post contains affiliate links. All expressed opinions and experiences are my own words. My post complies with the Word Of Mouth Marketing Association (WOMMA) Ethics Code and applicable Federal Trade Commission guidelines. Beautiful work!!! I luv it! But Am I missing where the plans are? Sorry about that – the link to the plans is working now! The link for the plans is not working! I am looking forward to building this for my boys!! It is awesome! Im curious also on the height from top to bottom. This is absolutly stunning!!!!! It’s 8 feet tall. We have 9-foot ceilings in this room. Can you give the overall height from floor to top if the gable? 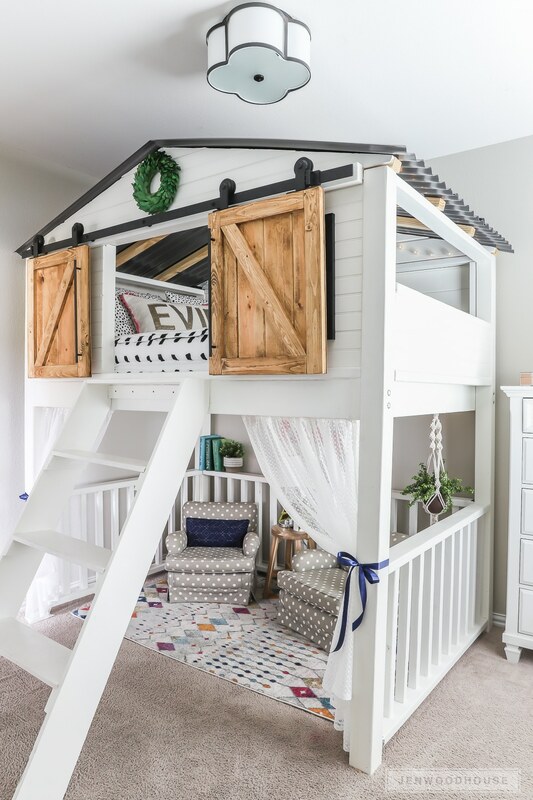 Hey there this is such a cute idea its beautiful and functional, leaving the little ones with room to play! I was just wondering, what is the estimated cost to build this project? thanks for sharing. Thanks Jacqueline! We love it! We spent about $550 on materials, though this may vary in your area. Is it possible to make this in twin size instead? I LOVE this. I love this design, but did I miss the part where you share how on earth you change the sheets? So cute! No, you didn’t miss it, Jeannie! Lots of people are curious about this, so I’m going to be posting a sheet-changing video on my Instagram stories shortly! Update: you’ll find a video of how we change the sheets in my Instagram stories highlights under “DIY Loft Bed.” Hope that helps! Any idea what the weight limit on this would be? Just concerned about weight if 2 or 3 kids climbed up there to play. I don’t know what the weight limit is, but the bed is secured to the 4×4 legs with carriage bolts, which makes it SUPER strong. My husband and I, along with our two kiddos (over 400 pounds total) have all been up there at the same time during bedtime stories and there were no issues. Hope that helps! This is awesome. Perfect for girl or boy with a few tweaks. Thanks for sharing. Where is the materials list for the wood, all I see is rhe steel roof and nuts and bolts. You’ll find the link to download the plans in the post – click the grey “Download Plans” button! I really like this loft bed with the sliding barn doors but was wondering if it could be modified so I can use a twin mattress instead. Because my daughter’s room is to small for a full size bed. 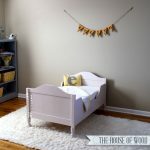 I REALLY love this bed idea for my daughter who is two and transicitioning from the Crib into her 1st toddler bed! And if I wasn’t pregnant I’m sure I could do it myself! Do you know anyone in Atlanta Ga that I could pay to make this for me? Congrats on your pregnancy! 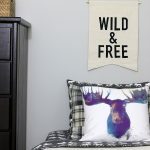 Check out PineandMain.org – you’ll find a network of makers in your area. Hopefully you’ll be able to find someone local! Best of luck! I love this!!! 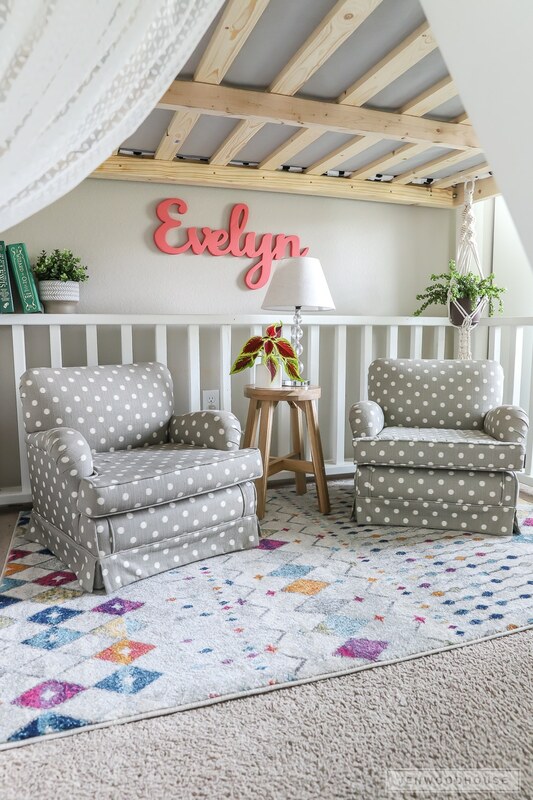 My little’s room is to small for a full size bed, do you have any recommendations to make this for a twin size bed? 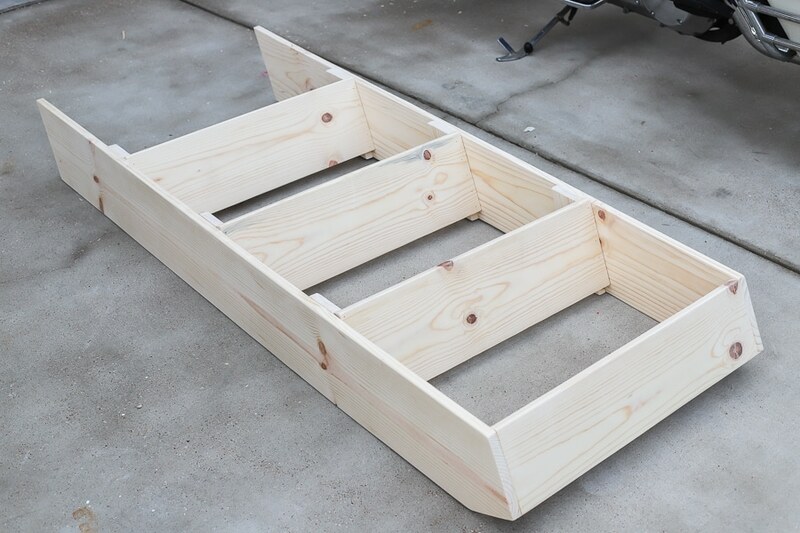 Building this bed now. I have a full woodshop so I have a little bit of an advantage, but so far so good! 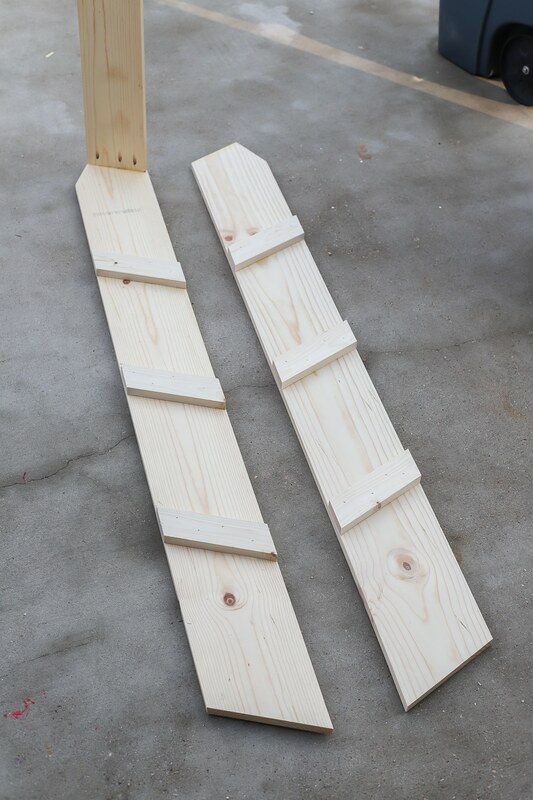 One issue – the stairs (stringers) are marked at 59.5” in the Cut list, but once you cut 25 Degree angles on either end you will have an (around) 56” tall piece. This renders the stairs too short to meet up properly with the side of the bed support. So mine had to be trashed and cut longer so that the final length was the correct 59.5”. Might just want to annotate in the Cut list that the stairs stringer length should be oversized by 4” to allow the angle cuts on either end. Thanks so much for the input, Adam! Glad to hear everything else is going well! Was curious about the 6 fence brackets. Where do you use the other 4? 2 of them wer used for the middle brace to prevent the matress from saging. The other 4 fence brackets are used to attach the back railing to the legs. I’ve tried to get the plans but I still haven’t received them. You might want to check your spam folder. I’m showing that the plans were emailed on April 16th at 7:58pm. Oh my, the barndoors are an adorable concept. My son has wanted a loft bed for over a year, and I’m certain he’d love the idea of having sliding doors on the loft too! The dimensions are 86″w x 56″d x 96″h. I posted a video on my Instagram stories highlights, showing how I change the sheets. Check out the “DIY Loft Bed” highlight. Hope that helps! We just built this and getting it all together! Love it! Where did you get the handles for the doors at? I’ve searched and haven’t had any luck. Thanks! So awesome to hear, Megg! I had these pulls from a previous project, but I found a bunch of similar ones here: https://homedepot.sjv.io/c/1241677/456723/8154?u=https%3A%2F%2Fwww.homedepot.com%2Fs%2Fappliance%252520pulls%3FNCNI-5 Hope that helps! My local hardware stores don’t carry those roof panels. Would steel roof panels be too heavy? Would I be better off with plywood? We are in the finishing stages of completing this bed and now the blueprints have disappeared and are saying we need to pay $20……literally at the stage of putting it together and having a few measurement issues and now no blueprints….. Yes, the plans were available for free for several months and are now available for purchase on Spruc’d. An email of the plans should have been sent to whatever email you provided when you requested them. The plans were sent but now it just takes me to the 404 error page and I can’t see the blueprints without purchasing. What email did you use to request the plans? About how many hours did you put into building this? How many hours did you have in building this? Do you have same plans but for a twin size?? Not at the moment, but maybe I should draw them up because I’ve gotten several requests! I’m planning to purchase the plans for this but I wanted to confirm first. Do you provide recommendations on modifying this for 8’ ceilings? Also here to hop on the twin size train. Please please PLEASE do a twin size. My little guy would love this as his first real bed. I’ve been planning on making the cabin bed but I love the doors on this and the ability to play underneath. 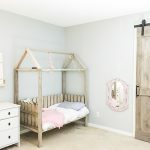 Re: twin size sliding barn door loft bed – I’ll put it on my To Do list! Thanks for your note! I used Benjamin Moore’s Simply White and Varathane’s Golden Oak stain on the doors. Hope that helps! Can you easily add a full size bed to the underneath part instead of a sitting area? Do the plans reflect that option? No, the plans don’t include a bed underneath, but it would be an easy modification! In fact, I’ve seen a few of my readers convert this loft bed to a bunk bed! The lowest cost for a sliding door kit I found was 82 dollars and you need two. A bit pricey; any other sources? I think you may be able to find them cheaper on Amazon. Good luck! I’d love to see this as a bunk bed as well! Where can we see brag posts from other readers who have built this? You can search the hashtag #jenwoodhouse on Instagram and see reader builds! Sure thing! I just re-sent them via email. Thanks! I am going to purchase the plans for this bed but we only have 8 foot ceilings. Can it be modified to fit in a room with 8 foot ceilings? The top of the roof is 8 feet tall. 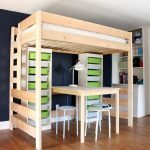 You could modify it so that the legs are shorter, but keep in mind, this will decrease the head space under the loft bed. Hope that helps! So adorable!!! I’d love plans for this as twin bunk beds! Building the loft bed for our granddaughters. Working on the ladder. What angle did you cut the top of the 1 x 8 to make it flush against the mattress box? Great to hear! I hope your granddaughters love it! The bottom of the stairs are cut at a 25º angle and a right angle at the top. 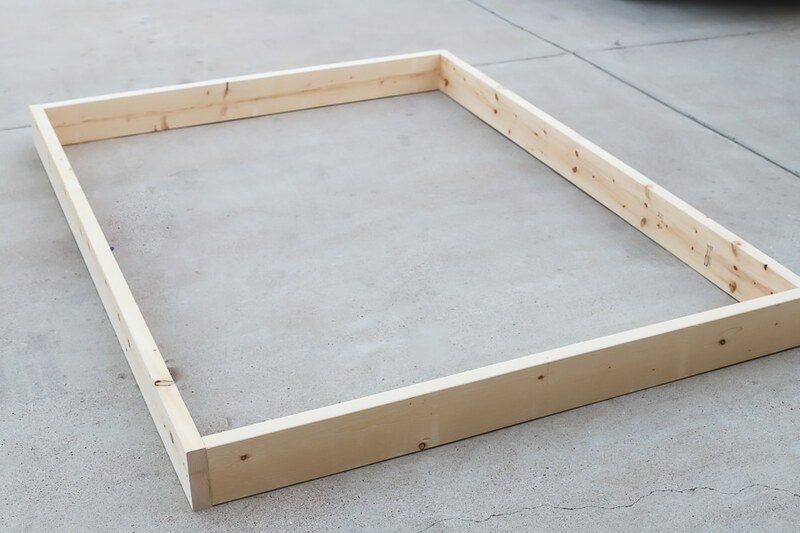 I’d recommend cutting the bottom edge of the 1×8 first, then hold the board in place up against the bed, trace the mark and cut the boards to fit. Hope that helps! Love this! Side note. Where did you purchase the cute chairs underneath. 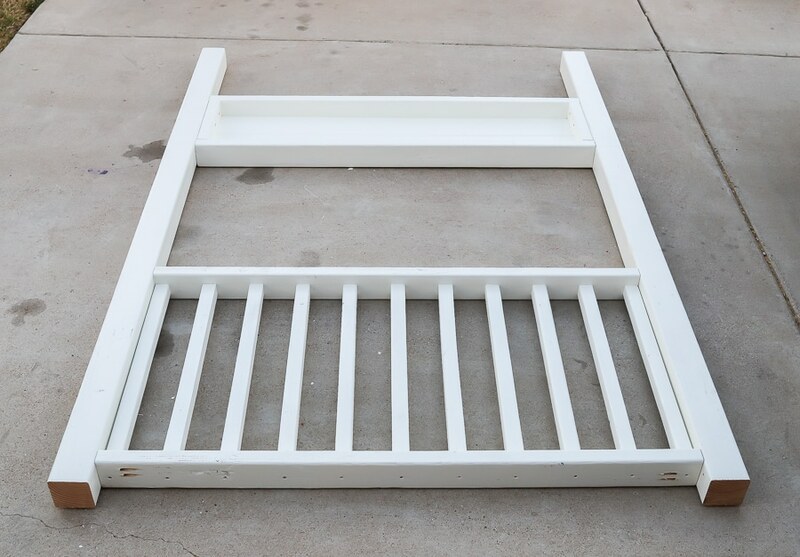 Have you gotten around to modifying this for a twin bed? 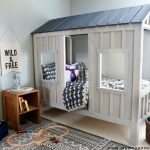 Hoping to get my husband to make this a twin bunk for our boys! Hi Jen. I’ve been working on this bed as a project for the past few months, and it is looking great. I am ready to get going on the roof and barn door assembly. In the plans it looks like the measurement in length for the assembly is 79 inches, but the link that it takes you to in the home depot website is for a 72 inch set, which seems too small as I started to put it up. I also noticed on this page that you said you cut down the barn door assembly from 96 inches. Did you get that 96 inch assembly from home depot? So sorry for the confusion! 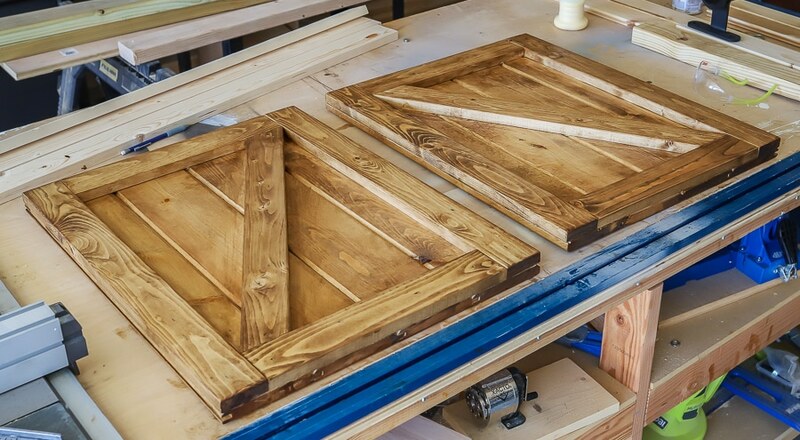 Yes, we did get the 96″ barn door kit from Home Depot – sorry about that incorrect link! I’ll try to find the right link and replace it in the post. We cut our rail down from 96″ to 79″ however, I think the 72″ rail just might end up working for you, because we have about 4-5 inches overhang on each side of the rail… hope that helps! Love this! Curious how you got the mattress in there (maybe I missed it)? Also, would a full size bed fit below? 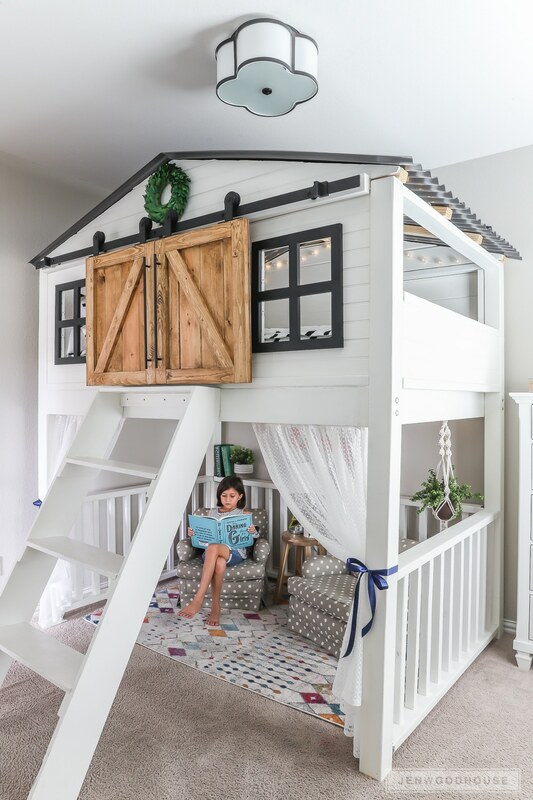 We are moving and my 4 year old will be in a room with a 10 ft ceiling – was thinking this would be perfect for her room – but she still requires me to sleep with her on occasion and I was wondering if the bed could be put below and then the top could be used as a hideaway, reading nook. 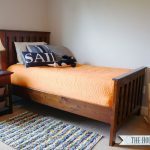 I was looking to see if I could find something similar pre-made that wasn’t to expensive – was shocked to see that this exact bed was being sold for over $3,000! For that price, I am thrilled to see the plans and build it myself for a 1/4 of the price! We put the mattress in there once we had 3 of the four sides assembled. This is noted in the plans. And yes – you can put a full size bed underneath and make it a bunk bed! I’ve seen several of my readers make this modification to their own projects and it’s absolutely adorable! Good luck! If my ceilings are 8 ft, is there a way to keep this structurally sound, but also reduce the height? Sure! You can make the legs shorter, but keep in mind, this will also reduce the height under the bed. Hope that helps! This is such a cute idea!! I was definetly thinking of doing this but if my daughter already has a normal twin and full flat bunkbed, do you know what the appoxomite adding of stuff price would come out to? You and your husband did a great job! I can’t wait to make this. Where did you get the sheets from? How tall is it Jen? Hi i was wondering if you could adjust the size of the height of the whole bed down to 90”? I have an 8’ ceilings in my kids room. I absolutely adore these plans, the downside, i have super low ceilings at 7.5′ how tall is this loft bed without the roof? Or, how tall is the roof from the beam that the doors slide on to its top? I was hoping that without the roof this may fit in our small space. The overall height of the bed is 8 feet tall. You could reduce the height by cutting down the legs, but do keep in mind this will also decrease the overhead space underneath the bed. Hope that helps. Best of luck on your project! In your plans, do you include tools needed for making this bed. I’m new to the DIY for furniture and stuff. Just want to make sure I have the proper tools before starting the project. Yes! A tools, materials, and cut list are all included in the plans, as well as 3D diagrams for each step. Hope that helps!